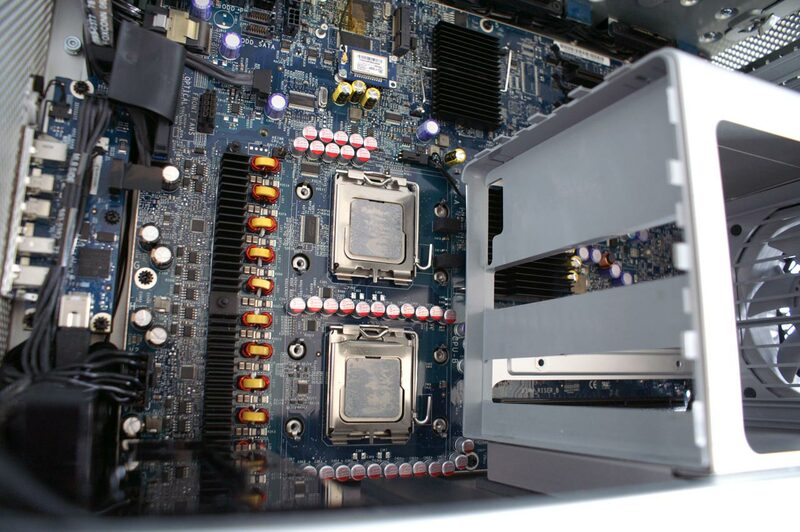 Although the socket looks very similar to a desktop LGA-775 socket, it does have fewer pins and a different pinout so don't try to install a LGA-775 processor in these LGA-771 sockets. Thankfully only Xeon processors are LGA-771 so as long as you order the right CPU you should be good to go. We chose to go with the fastest CPU currently available, the Xeon 5160 that runs at 3.0GHz; the 5160 is also available as an $800 upgrade through Apple when you're ordering a Mac Pro. 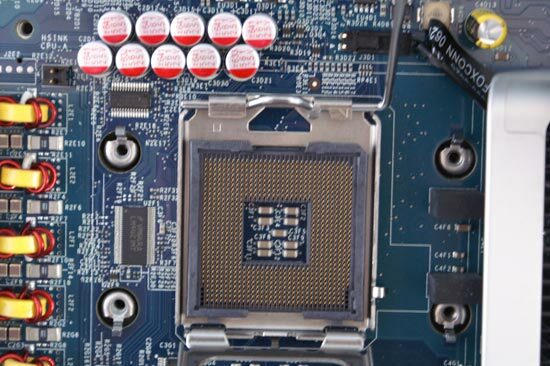 Be extremely careful in removing/re-seating the Xeon processors in these sockets since all of the pins are in the socket itself and are a pain/virtually impossible to fix if they get bent. It's usually very easy to spot a bent pin just in case you do do something on accident. Pay attention to the orientation of the CPUs that are in the Mac Pro when you remove them, and install the new ones in the same direction. You can also look at the contact points on the back of the CPU to confirm the installation orientation. As a final fool proof check there are also cutouts on the sides of the chip that will only let it sit flat in one direction. If you've never installed a chip into a LGA socket before, double and triple check you've got the orientation right before you pull that lever down. Of course you'll want to put some thermal grease on the new CPUs; be sure to keep the grease off of the pins in the socket and avoid using too much/too little. With the new CPUs installed we mounted the heatsinks (don't forget to reconnect their cables) and installed the fan assembly. As a quick test to make sure that everything worked ok we didn't re-assemble the memory cage and did a quick boot into OS X to see if the new CPUs worked. Once we confirmed that they did, we completed the reassembly. 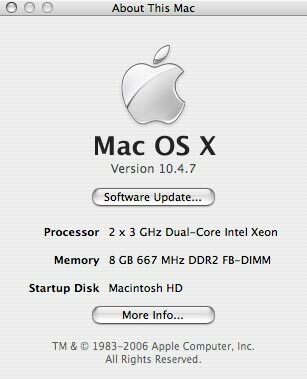 The Xeon 5160s were recognized properly by OS X and worked without a hitch, so it looks like there's a real, widely available upgrade path to Mac Pro owners down the line. As Intel processors are easy to come by, you shouldn't have any problems putting faster Xeons in your system.